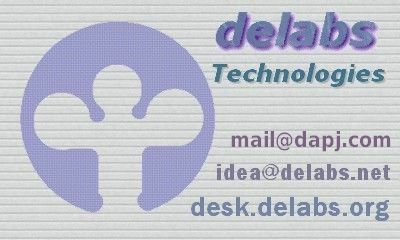 delabs Technologies has two main sections and brands - delabs Technologies and dapj EE Publications. These together form an Electronics Informatics and Product Design Technologies Web Consultatory. Services - E-Learning and Consultancy for Engineering, Design and Development of products, system and processes. Generating and Promoting Open Design Ideas for Future Technologies in Handheld Devices using Web Technologies for Automation and Control. Resources of delabs encompass subjects like Analog Design, Power Electronics, Circuit Design, Instrumentation, Process Control. These help engineers and other professionals get information of products, services and companies. These people may be R&D, Production or the Procurement departments of the technology companies. Introduce yourself or let delabs become aware of your Firm, Use this form Contact delabs. You can Advertise in the delabs Pages and Tech Blogs, Read more here - Advertising in delabs. Circuits FAQ has the EE questions and answers, If you want a product designed by delabs you can visit the Design Service page, which is a paid service. Ideas, Methods and Concepts of delabs are its own Intellectual Property. Credit delabs as the source, when you talk or discuss about them.